Megohmmeter (sometimes referred to as a megger) is a special type of ohmmeter used to measure the electrical resistance of insulators. Insulating components, for example cable jackets, must be tested for their insulation strength at the time of commissioning and as part of maintenance of high voltage electrical equipment and installations. For this purpose megohmmeters, which can provide high DC voltages (typically in ranges from 500 V to 2 kV) at specified current capacity, are used. Acceptable insulator resistance values are typically 1 to 10 megohms, depending on the standards referenced. MultiMeter/1000V Insulation Tester with Wireless PC interface (915MHz). The MG300 is a True RMS multimeter with built-in insulation resistance tester with the added safety of wireless data streaming for remote monitoring and data logging. By adding insulation testing capabilities to the ubiquitous digital multimeter, electricians are always equipped for insulation testing, helping make it a more routine part of predictive maintenance with faster troubleshooting and repairs without additional tools. The rugged and waterproof (IP67-rated) combination meter includes a digital insulation resistance tester (or megohmmeter) with 4 different test voltages for measuring resistance up to 4GΩ with 0.001MΩ resolution. 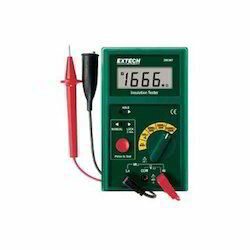 1000V digital tester with automatic 3 minute test. 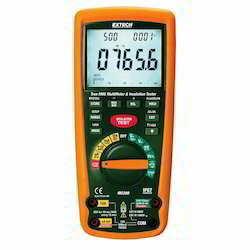 The 380360 is a 1000V digital tester with an automatic 3 minute test. Three test voltages of 250V, 500V and 1000V. Insulation Resistance to 2000MΩ. Automatic discharge when safety "Press to Test" button is released. Complete with 6 x AA batteries, heavy duty 2.5 ft. (0.8m) test leads, alligator clip, large probe and case with neck strap. Wide Range Measurement up to 5kV with Insulation Resistance to 60GOhm. With the 380395 measure Insulation Resistance to 60GΩ with test voltages of 500V, 1000V, 2500V, and 5000V. Featuring polarization Index measurement (PI), Dielectric Absorption Ratio measurement (DAR), AC/DC Voltage measurement to 600V with Min/Max, Peak and Relative functions, and 1 to 15 minute timer function for IR measurements.